I was saving t he Bartlett pears for the "Seasoned Pear Almond Compote" in the Ball Complete Book of Home Preserving. First I grated the zest off 2 lemons, managing not to thoroughly destroy my fingers in the process. Then the lemons were squeezed and the juice and the zest mixed with 3.5 c. of chopped pears. It took just about 4 pears to make 3.5 cups. 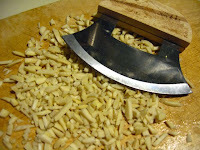 Next, I chopped up slivered almonds with my ulu which is much easier to use than a regular knife. These were mixed into the pear mixture along with 6 c. of sugar and then the mixture sat at room temperature, covered, for 1 hour. 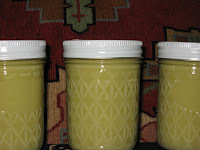 The last ingredient other than liquid pectin was 1 tsp. of finely chopped ginger root. I ended up with 7 half-pint jars. This is the first time I've added nuts to anything I've canned. It's rather yummy! I should never go to Whole Foods. In addition to yesterday's Muscat grapes, I have been thinking about doing something with the Bartlett pears every time I go in there and see the great big display of them. So I bought a bunch yesterday. 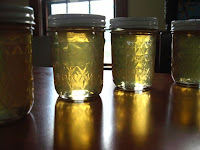 Then I went on line and found a recipe for vanilla pear jelly. 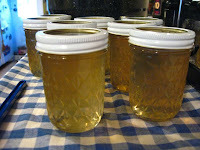 However, th e jelly requires Anjou pears. OK. So I went out this morning to the store (not the Whole Foods) and bought 8 Anjou pears and proceeded to caramelize them. I am not sure that was the intended method, maybe I cooked them too long? I was gardening at the same time. Anyway - I got about 1/4 cup of juice. So I tried a trick from one of my cookbooks and steeped the pears with boiling water. I had to do that twice to get the 3.5 cups of juice needed. Also, I added an extra teaspoon or 2 of vanilla. The vanilla is from Penzey's. It smells glorious! The rest of the recipe went fairly smoothly. I ended up with 5 half-pint jars and some in a tupperware container. The family is busy dipping 'Nilla wafers in it. Today I was shopping in the Whole Foods and found something new to me. Muscat grapes. I had never even tried them before. I don't like tasting grapes in the store, so I had no idea what I was buying, but the little sign said, "Available for only 4 weeks a year!" I'm such a sucker for that kind of advertising. If it's unusual, I'll buy it. Especially if it's a food. (Grocers, take note!) I bought 6 pounds. 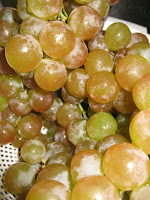 Eating a muscat grape is like having a little ball of perfume in your mouth - but not in an overpowering way. They are sweet and fragrant. And they have a pinkish glow that is very pretty. Compared to the green grapes they were next to, they looked richer. Healthier. Like grapes should look. My older child tried some and referred to them as "Honey Grapes." Aren't they lovely? So I used 3 pounds to make grape jelly. 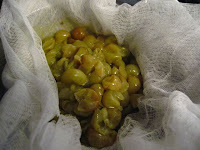 I extracted the juice by crushing and boiling the grapes with 1/2 c. of water and then straining with cheesecloth and a strainer. I just barely got the requisite 4 c. of juice (didn't want to add water and dilute the flavor) and then followed the directions on the package of Certo. (7 c. of sugar, 1 package of Certo.) I ended up with 8 1/2 c. of jelly. The whole family ate another 2 pounds before dinnertime and I'm currently snacking on some more while I write. I may have to go back and buy some more before that 4 week window is up! One wouldn't normally think that a ham sandwich is something extraordinary. However, I have paired it with a jam that really worked with it. Rhubarb-Pineapple jam! When I was cooking the ham I glazed it with the same jam, and really liked the taste, so the leftovers are being treated with the same combination in sandwiches (plus a little mustard). 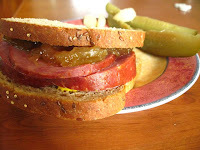 In addition, the pickles are dill pickles I made on my birthday last year. Even the pickled garlic is delicious!